Many people are familiar with Andersonville, the notorious Confederate prisoner of war camp that held Union soldiers during the Civil War, but fewer know of Camp Douglas, a Union camp that held Confederate prisoners on Chicago’s South Side. 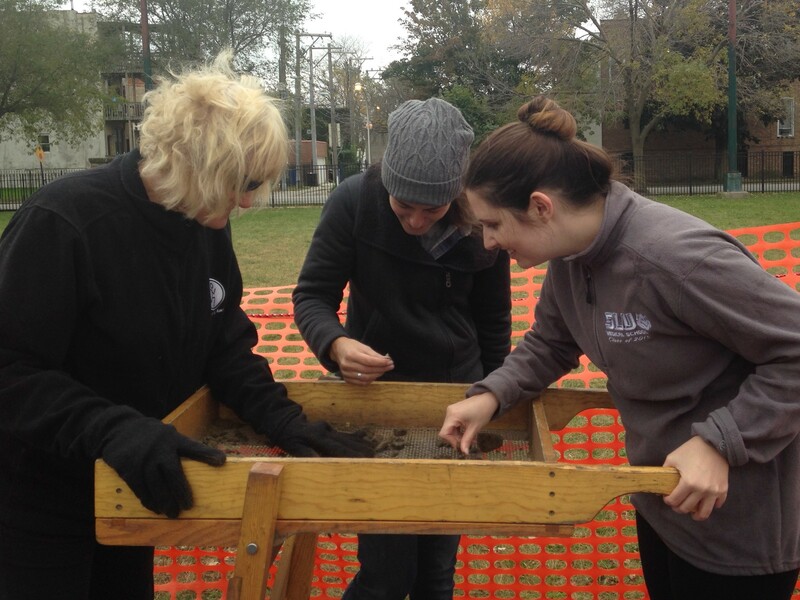 Between October 8th and 14th, we—and others from Loyola, DePaul, and the community—worked as volunteer archaeologists on a dig with the Camp Douglas Restoration Foundation, uncovering elements of Chicago’s Civil War past, and learning some basics about archaeology and the processes that go into a dig. From 1861 to 1865, Camp Douglas occupied about 80 acres in what is now the Bronzeville community. Initially, Camp Douglas was a training ground for Union soldiers, and would later train enlisted African Americans. The camp was designed to be temporary, since the Union was confident the war wouldn’t last long. But by February 1862, Camp Douglas had become a prison camp for Confederate soldiers captured in battle, since the Union Army had nowhere else to put them. Camp Douglas became one of the largest prisoner of war camps in the nation and had the most Confederate deaths of any camp. Poor sanitation and overcrowding in makeshift wooden shelters spread disease among the prisoners, resulting in approximately 4,500 deaths (the prison housed roughly 30,000 prisoners through the course of the war). Security was slack and escapes were frequent; an estimated 500 Confederate prisoners escaped during the camp’s operation. After the war Camp Douglas was quickly dissolved, and for the most part, forgotten. October 2015 excavations. Photos by Kelly Schmidt, 2015. Since June 2012, the Camp Douglas Restoration Project has been striving to recover the hidden history of this landscape. 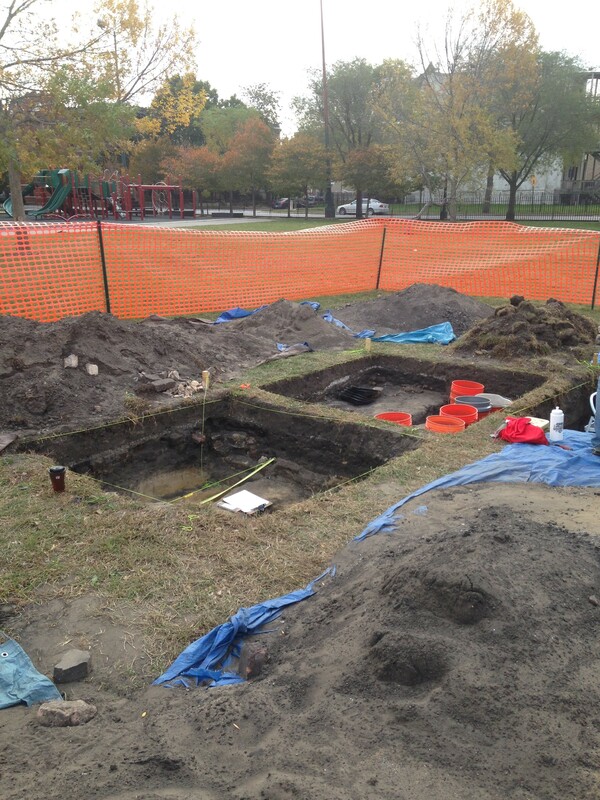 Now on their sixth dig, historian David Keller, DePaul University archaeologist Michael Gregory, students in DePaul’s Archaeology Field School, and community volunteers have been excavating a portion of the site of the former camp, now the John J. Pershing Middle School playground. The project aims to highlight the historical existence of the camp and generate public interest in the camp’s story. Participation in the dig is open to members of the public, who receive basic training and oversight from the archaeologists. Since June 2012, the dig has grown from ten non-student volunteers to over sixty this past October. The project even invites participation from the Pershing schoolchildren, who have been involved in reading comprehension, writing, and theatrical assignments and discussions related to the dig, as well as in mock digs in preparation for participation in the excavation itself. Archaeologists and volunteers excavate site. Photos by Kelly Schmidt and Adam Widera, 2015. 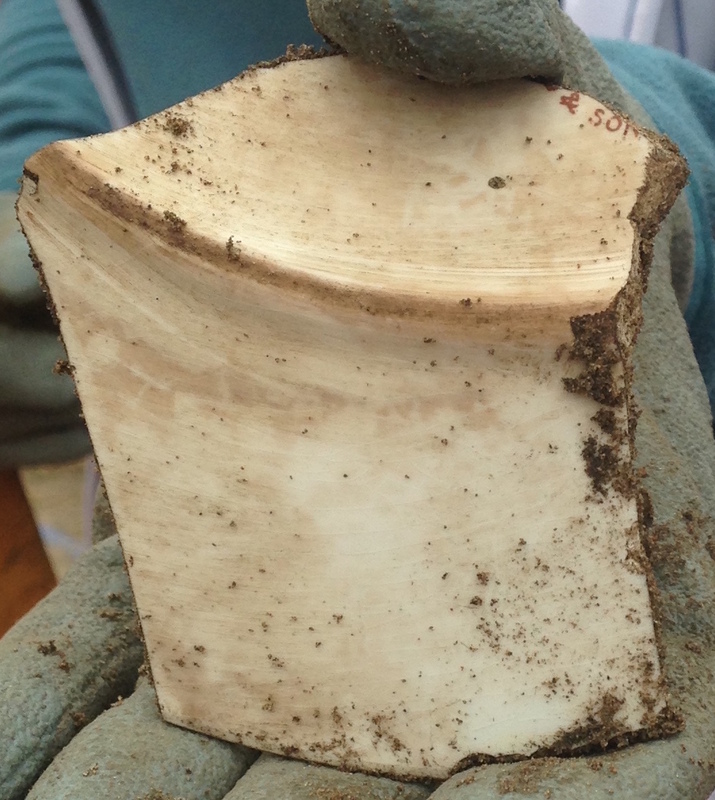 The most recent dig took place in October, continuing a dig from the previous fall and spring. 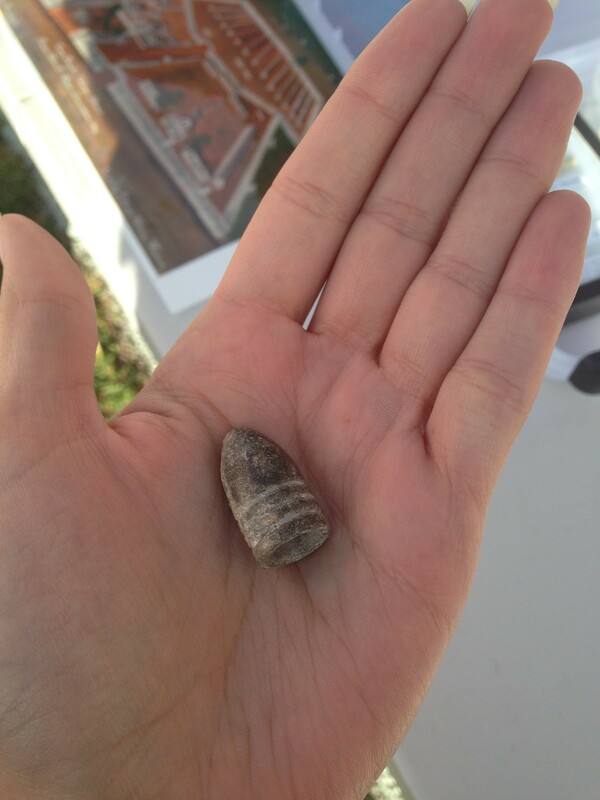 Participants unearthed signs of camp life through finds such as pipes, minie balls, inkwells, marbles, and dishware. Archaeology students in DePaul’s field school process and research the artifacts, which are then stored and maintained by the Camp Douglas Restoration Foundation, and intended for eventual display in a museum run by the Foundation. Artifacts from Bronzeville layers will be offered to the Bronzeville Historical Society, tourism center, Public Library, and the Pershing School, to maximize their visibility and use by the community. Ultimately, it is visibility and community that set the Camp Douglas dig apart from so many other forms of archaeological and historical investigation. 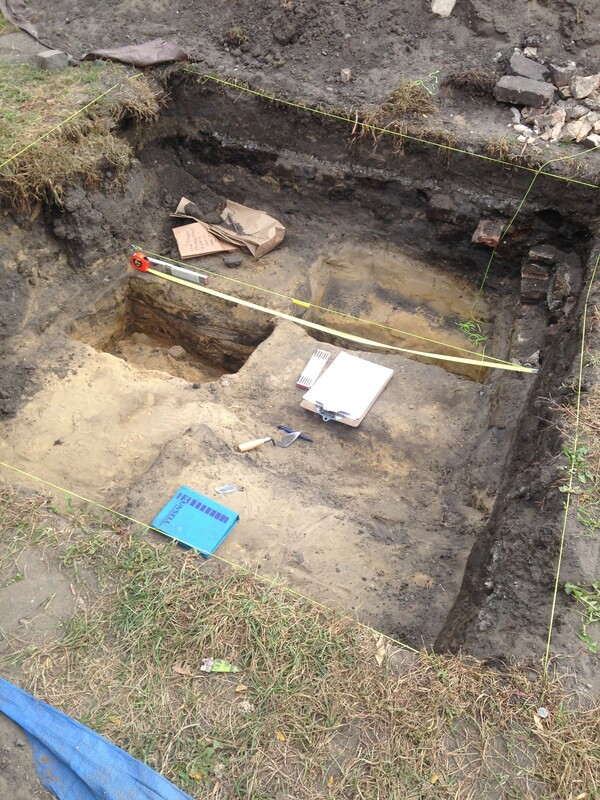 As the Camp Douglas dig unearths elements of Chicago’s Civil War and Bronzeville history, it also reveals the mechanisms used by archaeologists to retrieve that history by engaging an interested public. 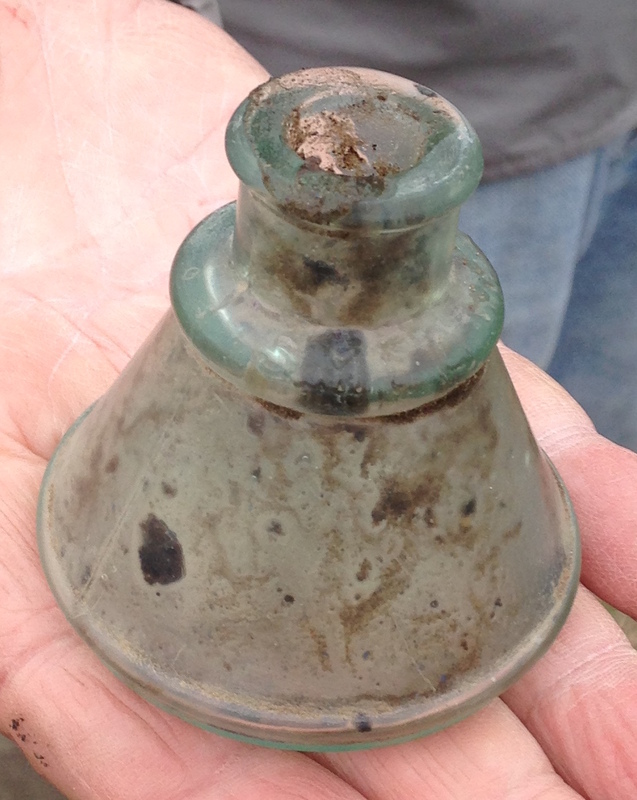 Inkwell, button, and pipe fragments found at site. Photos by Kelly Schmidt, 2015. Why did you choose to ask for help from the general public? We found public interest when people found out about the digs. We believe it is good community relations and also fun for volunteers. Did you have any concerns about working with people who are not archaeologists or training to be archaeologists? None. Professional archaeologists provide adequate training and supervision that preserves the integrity of the excavations. Volunteers are mindful of the requirements and act accordingly. How long will it take you to sort through everything that was found—from Bronzeville to the Camp Douglas layers? Depending upon time of DePaul Archaeological Field School students, about a year is needed to clean and properly dry the items. Research into origins, etc. takes even longer. 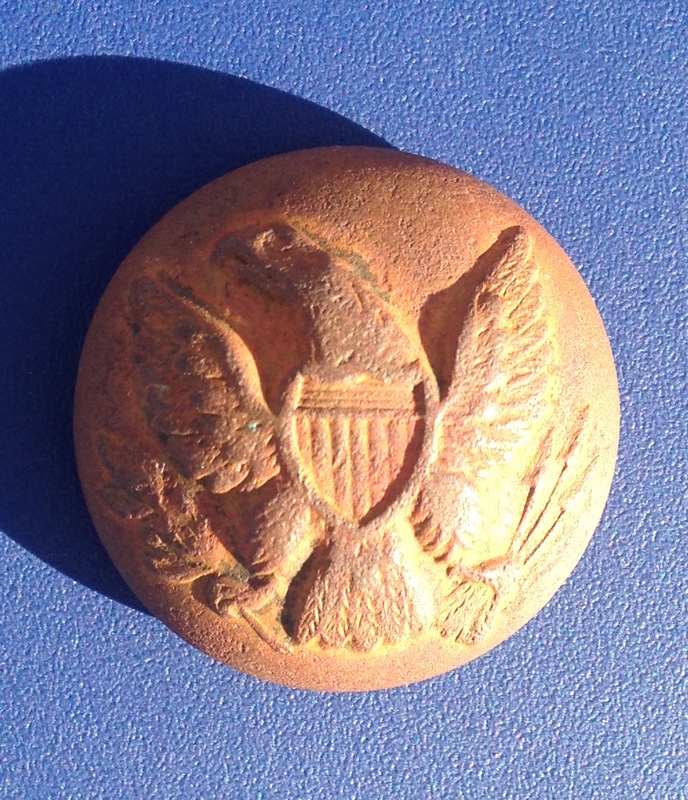 What’s the most interesting item that was found over the weekend? Three mini-balls and a number of percussion caps from Camp Douglas. Several bottles and broken plates with maker’s marks offer good potential for additional information. 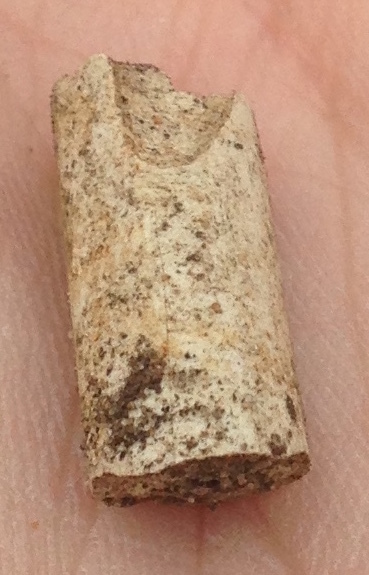 Minie ball and plate fragment with maker’s mark. Photos by Kelly Schmidt, 2015. What area of Camp Douglas is being excavated? How large was the camp? How did you determine the location? 2012-Headquarters section of Garrison Square, Pershing school-SW corner of Prisoners Square. Selected as sites that were available. The largest land owner Draper and Kramer have been very uncooperative. Sites were on public property. Exact locations were determined by reviews of ground penetrating radar tests on the areas available. The camp consisted of 60 acres. 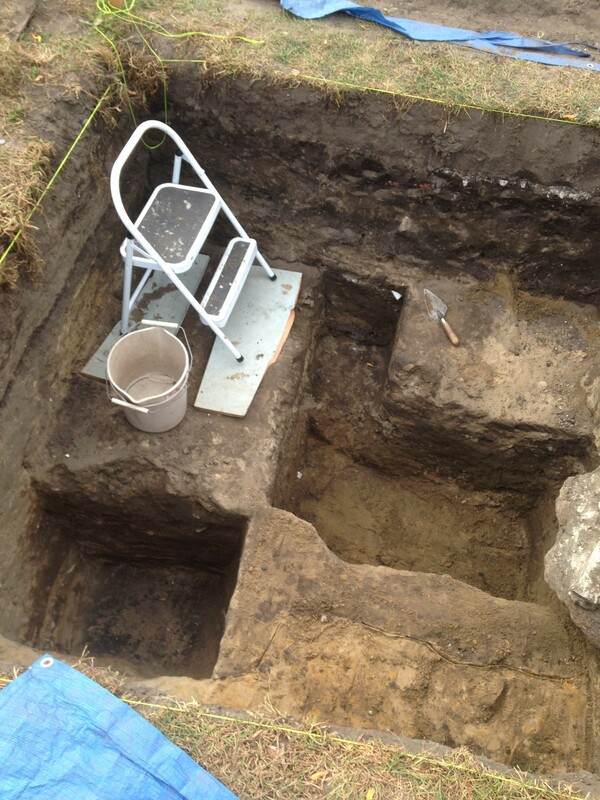 We have excavated a very small portion of the camp. 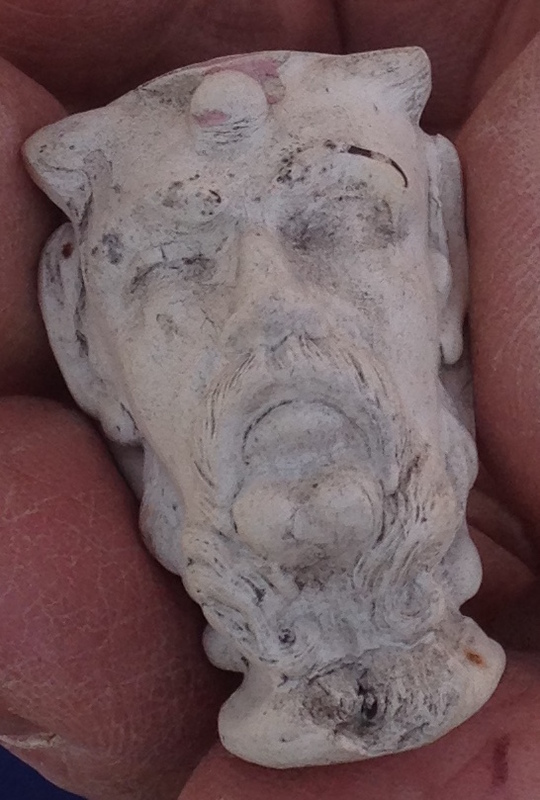 What’s the most interesting item that you’ve found from all of your digs at Camp Douglas? Foundation stones of the headquarters (2012) and the “B” Cap insignia (2014). 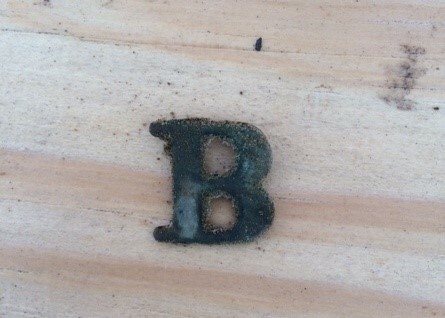 The “B” was probably the first Civil War military artifacts found in Chicago in 100 years. Company “B” cap designation pin. Photo by Greg Mycio, 2014. What type of response have you gotten from the community (neighbors, Civil War enthusiasts, etc.)? Nothing but very positive including sharing stories, photos and other information of historic value. Also several have offered to allow excavation in back yards. Only Draper and Kramer has been negative. Civil War and historical organizations have been very supportive. 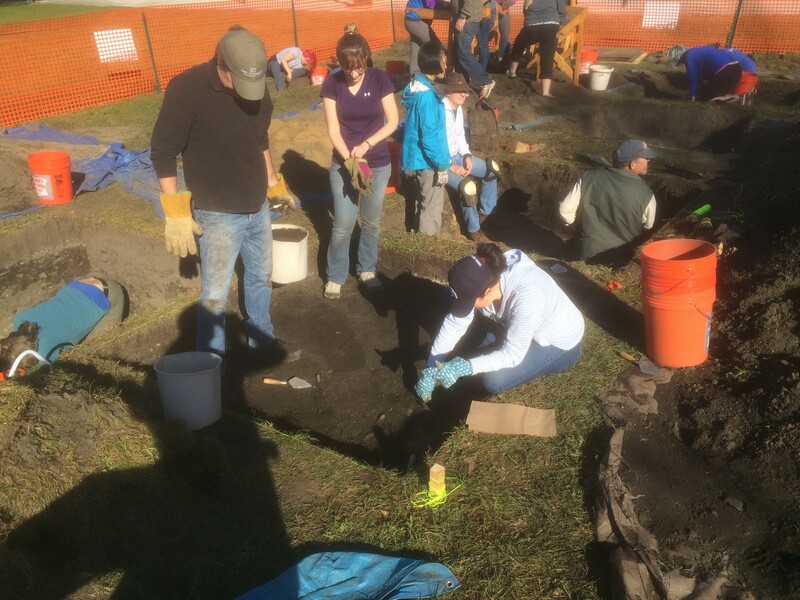 The next Camp Douglas dig will occur in either May or June of 2016. If you would like to get involved, or simply learn more about Camp Douglas or the excavation process, email David Keller to be placed on the Camp Douglas Restoration Foundation mailing list, or follow the Camp Douglas Restoration Foundation on Facebook.